Face made in the likeness of "Data" from Star Trek The Next Generation. I hope you enjoy. niauropsaka (3 years ago) Inappropriate? 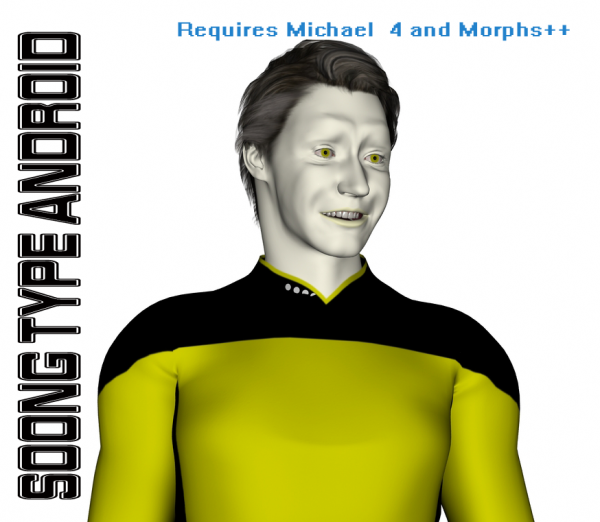 Oh, good, I was looking for a Brent Spiner face morph. That's really good! I'm really impressed! Jeremy Vilmur (9 years ago) Inappropriate? I used the daz studio 3 human surface shader and played with the colors in the surface controls. If I could get some good hi-res images of Data I''d try to make a skin. Jed Hirsch (9 years ago) Inappropriate? mrvet (9 years ago) Inappropriate? Way to go, I''d give 25 stars! Thanks.Way to go, I''d give 25 stars! Thanks. Oh come on 2.5 stars? Really? Yes, I actually meant to put that up today but got kind of busy. I will have to move beyond TOS now. Any thought of putting your Picard Morph here?